The tiger is symbolic of the physical world and the dragons signify the mental or spiritual world. Together the symbols represent a harmony between both worlds. The Chinese symbol Yin/Yang (Oom/Yung) stands for balance of life. 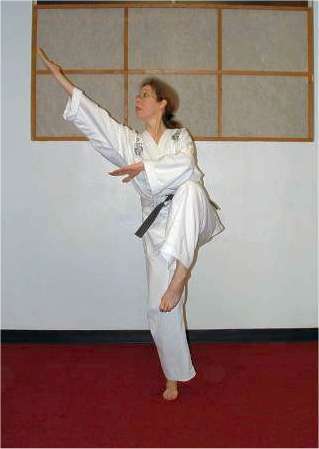 One of the many personal achievements of Grandmaster "Iron" Kim is the Kyong Gong Sul Bope (flying side kick). Above is Grandmaster jumping from the top of a building. (The roof is visible in the lower right corner.) In 1970, Grandmaster "Iron" Kim demonstrated Kyong Gong Sul Bope by jumping from the equivalent of an 11-story building. In 1972, Grandmaster "Iron" Kim again demonstrated the Kyong Gong Sul Bope movement by jumping from the equivalent of an 8-story building both times landing without injury onto a sloped surface below. I began Oom Yung Doe not knowing what I would gain, and knowing this was something I needed to do. During the last 6 months, through this practice, I have received increased energy, coordination and confidence. 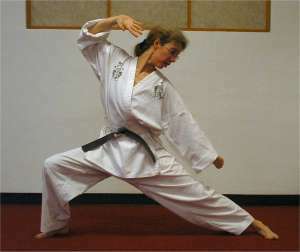 Through this practice I am healing from physical injury and muscular imbalance. And as important to me, through this practice I am learning my strengths and challenges as I explore my interactions with myself, with others and with the beauty of life! I am grateful to my instructors for their guidance.